Marvel's event, "Secret Wars," brought with it many unique series. I know that almost sounds like an oxymoron, but the paradox did occur that many books came out with most being surprisingly odd and interesting. Be it Law-and-Order-styled, "Thors," comic, or the dollar-bin title I'm going to discuss today, a slew of strange and intriguing comics were released to tie-in with, "Secret Wars," that varied in how much they actually related to the event or just were a fascinating surreal read. Stores also ordered way too much of the, "Secret Wars," comics so I was able to find all four issues of the mini-series, "E is for Extinction," in the same dollar bin. "E is for Extinction," draws its name from one of the story-arcs that occurred during Grant Morrison's amazing, seminal, and just plain spectacular run on, "New X-Men." 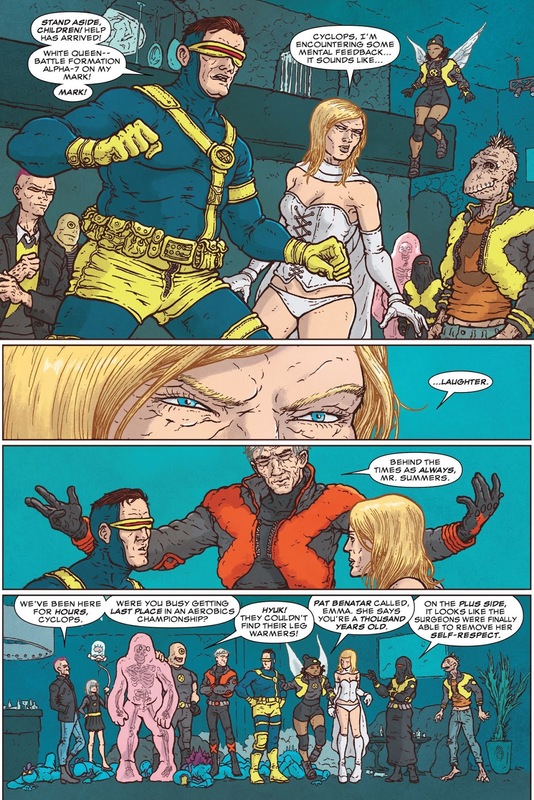 In this run he introduced all sorts of characters who were positioned as being the next generation of X-Men, gave us surprising twists such as mutants becoming more of a common minority as opposed to feared and hated freaks, a genocidal and outdated Magneto who learns the idea of him is more powerful than his actual self, and otherwise completely re-vamped and changed the concept of X-Men in the Marvel Universe. Such a good number of issues came from Morrison and his artistic collaborators. So, of course once he was done Marvel basically undid all of his efforts through events that lowered the mutant population, altered major twists (he killed Magneto and Marvel said, "Nevermind,") and otherwise ignored all that Morrison did besides keeping Cyclops and Emma as a couple, and using the wild plot-point about Charles Xavier having a twin sister as a story aspect Joss Whedon picked-up and ran with for his also-great stuff on, "Astonishing X-Men," that I remember fondly despite its many delays. Still, even if Marvel shuffled almost all the characters Morrison introduced to the side, spat on his story ideas, and ignored everything awesome, it still was a stellar run of stories, kicked-off of course by his, "E is For Extinction." So here we are now, in a, "Secret Wars," influenced Universe that draws immensely from Morrison's time on the comic, taking some plot-points to the conclusion he hinted at (the former X-Men are now old and useless in this new world) while changing some others in fascinating ways (Xorn had been a fake mutant created by Magneto in Morrison's comics, here he is real, and characters such as Sublime show up). The young mutants that Morrison introduced to us are now indeed the X-Men, with everyone from Beak, to Quentin Quire (thank God Jason Aaron brought Quentin back for some X-Men works as he is a good character, I forgot to mention that aspect of Morrison's run eventually sticking around), Martha the floating brain, and everyone else popping-up. Heck, they even got Ramon Villalobos to provide Frank Quitely-like art (Morrison had Frank Quitely often on his run) and Chris Burnham to write (who can also draw and his own art-style is a bit like Quitely's too). The entire four issues really read as one big love-letter to Morrison with its usage and alteration of concepts he brought us over a decade ago that still feel fresh today. 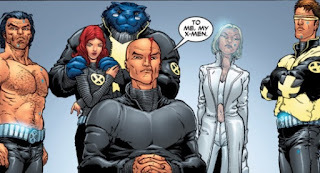 Because these things continue to have a new vibe, that makes this comic seem just as much ahead of its time as Morrison's stuff and like a reverse time capsule from an alternate universe--"Hey, this is what comics are like where the X-Men did get older and stories evolved in the way Morrison plotted." Magneto is revealed to be evil, but that's only the start of problems. 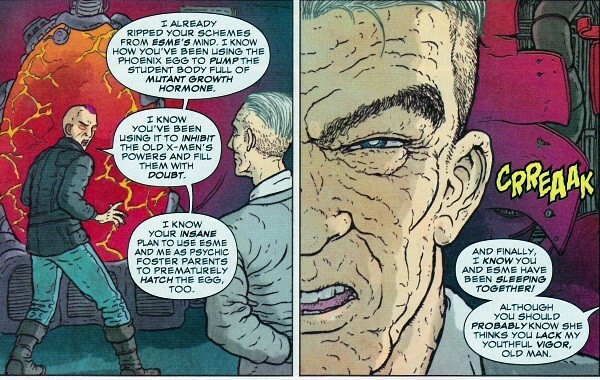 The plot itself involves the younger X-Men coming into conflict with the newer ones, as a Magneto who seems to have reformed himself after the death of Charles Xavier of course turns out to not be that innocent, but in the greater scheme of things is actually a lesser threat than many of the villains who emerge. There is some discussion of the, "God," Doctor Doom and the alternate worlds play a role, but one really would not have to read, "Secret Wars," to be able to enjoy this--I would say that it actually is more important to be familiar with Morrison's, "New X-Men," to get maximum enjoyment out of the references and allusions than anything else. Reading this comic from the dollar bin is a tad bittersweet as it shows all the better ways things could have worked out. Marvel absolutely flooded the market with some good, "Secret Wars," comics but there were so, so many, and some stores ordered too much that they can be bought incredibly cheaply. 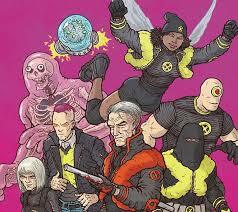 Grant Morrison's X-Men comics were amazing but Marvel chose to undo nearly every single thing he contributed. A comic series like this shows the directions Marvel could have gone with their works but chose not to--and many people may have ignored a mini-series this great as there just was too much in the way of, "Secret Wars," books that seemed to matter little in regards to the main storyline. From reading a comic such as this and considering the history it draws from--as well as the possible future, one can wonder what could have been to the same degree as what could be. 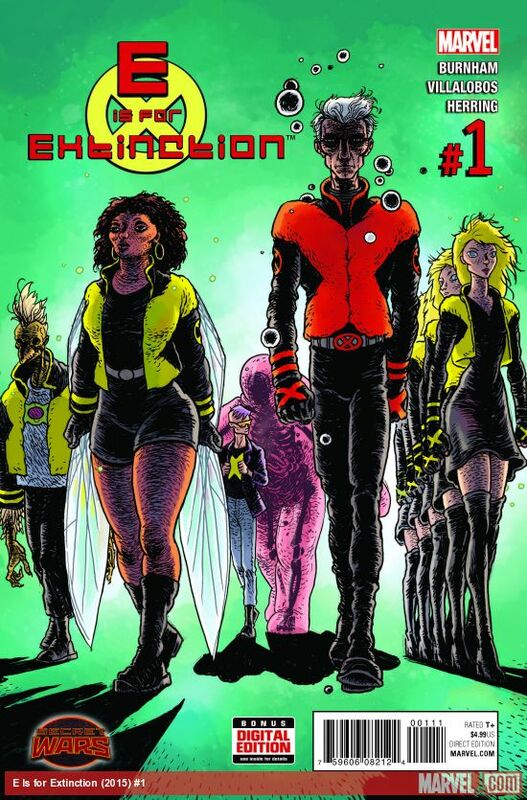 "E is For Extinction," deserved more respect from Marvel the first time the comics used that title, and a fascinating blend of homage, remix, and original ideas such as the, "E is for Extinction," we got in 2015 as a part of, "Secret Wars," deserved more respect from readers as opposed to being just another of the surprisingly solid tie-in comics that suffered due to the sheer amount of books and the horrendous delays the main comic faced. It is sad, but in all honesty you can generally expect a mixture of joy and sorrow when it comes to telling....a tale from the dollar bin!